If you've been watching American Horror Story from the beginning, you know there's one character whose return has been both inevitable and dreaded. We're talking, of course, about Michael Langdon. Last seen as a 3-year-old murdering his nanny in the final moments of the first season, Murder House, Michael is the Antichrist, since he is the offspring of a ghost and a human (when the evil ghost of Tate Langdon raped Vivien Harmon). As many have speculated since season eight's subtitle of Apocalypse was revealed, Michael is back as a young adult, and he's played by an actor who's no stranger to creepy TV shows. 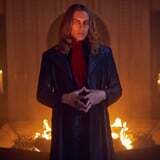 Cody Fern grew up in Australia, where he began his career on the stage. His early roles ranged from Shakespeare to world-premiere new plays, all based out of Western Australia. In 2014, he took on the lead role in the Australian production of the award-winning play War Horse. By 2017, he was moving into higher-profile roles in Hollywood. Fern played Jennifer Garner's son in the coming-of-age film The Tribes of Palos Verdes. Although the movie did very small box-office business, it received respectable reviews. The movie was Fern's first feature-length film. Fern's most recognizable role came in early 2018, when he played David Madson, the ill-fated ex of serial killer Andrew Cunanan, in The Assassination of Gianni Versace: American Crime Story. Like American Horror Story, the series is an anthology format, with each season focusing on a different famous crime. Fern had a recurring role during this season and was announced soon after to have been cast on American Horror Story, this time as the villain, not the victim. He's also slated to join House of Cards in an unknown role in its upcoming final season. After that show and American Horror Story, we're pretty sure we'll be seeing more of Fern in years to come!